In conversations with my friends the book The 5 Love Languages often comes up. The concepts of how we communicate with our spouse and how we like to be loved is very interesting to me. Some people hate Valentine’s Day because it’s commercialized. They are entitled to that. But I love it. I don’t see anything wrong with a designated day in the year to remember the people you love because sometimes we forget to show it in our everyday lives. But here’s the thing…I think often we show love to others how we like to be shown. For example, my love languages are Words of Affirmation and Quality Time. I might leave my husband a note telling him I appreciate everything he does when really he would love it more if I washed his car and gave him a big fat kiss (I think his languages are Acts of Service and Physical Touch). 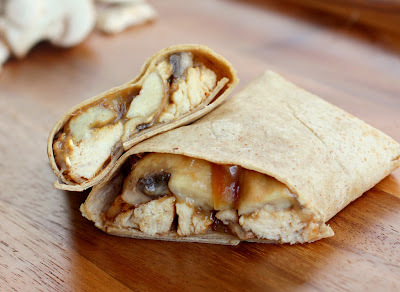 If the person you love is Acts of Service, make them this Gourmet Chicken Marsala wrap. It takes less than 15 minutes and has all of the flavors of the classic Chicken Marsala entree. After I made it I thought, “Where has this been all my life?” I think it’s a little casual for a Valentine’s dinner since it’s a handheld food but perfect for a quick lunch. Pair it with a salad and some crusty garlic bread. 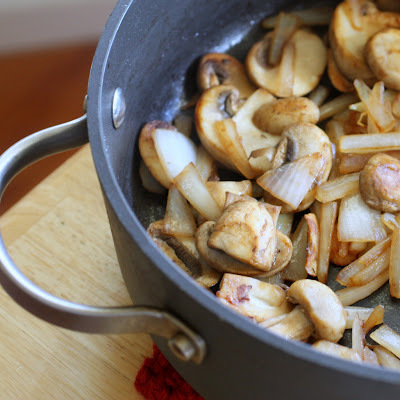 Sautee the onions and mushrooms. 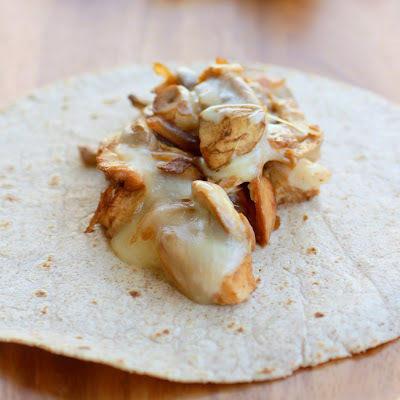 Roll all of the yummy flavors up in a tortilla. How many calories is this do u know!? I have no idea. Sorry! All men are Physical Touch. Um, yeah I’d agree with that! Yep, my husband is physical touch and acts of service also. And I’m just like you, words of affirmation and quality time. And even though we know we’re different, we still try to speak our own love language to the other one sometimes. Trying to get it right! I agree, all men are Physical Touch. I love Valentine’s Day too. And like you, I’m all about quality time and words of affirmation.